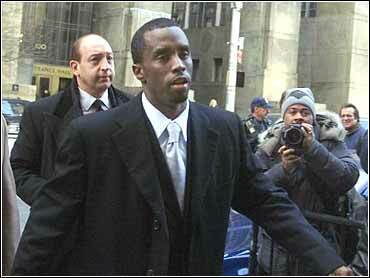 One day after Sean "Puffy" Combs left the witness stand, a defense witness testified Friday that he had seen co-defendant Jamal "Shyne" Barrow and another man pointing their guns toward the ceiling of a Manhattan hip-hop club. David Cubillette was the first witness called by Barrow's attorney, Murray Richman, after attorneys for Combs and co-defendant Anthony "Wolf" Jones rested their cases Thursday. While other witnesses have testified they saw Combs and Barrow with guns inside the Club New York on Dec. 27, 1999, Cubillette was the first witness to testify that another club-goer was armed that night. Cubillette, 28, was standing at a circular bar just before the shooting started in the early morning hours. He saw a man at the bar toss money at Combs, and then another man at the bar pull a handgun, then gunfire erupted. "The girl I was talking to pulled me down," Cubillette said. "Everybody was running. I got loose from her. I saw Shyne with a gun in his hand." Cubillette said Barrow's weapon was pointing toward the ceiling, and he never saw him level or fire it. He said he lost sight of Combs when the shooting began. Barrow, 21, a musical protege of Combs, is charged with three counts of attempted murder for allegedly shooting three people inside the club. Combs, using a sink-or-swim legal strategy when he took the witness stand Thursday, declared that he wasn't packing a gun and never offered a $50,000 bribe. Do you know who was being shot at? asked his lawyer, Benjamin Brafman. The prosecution alleges Combs was carrying an illegal gun when shooting started in the Club New York in Manhattan early on Dec. 27, 1999, and that Combs later tried to bribe his driver to claim ownership of the handgun that police found inside his Lincoln Navigator. Combs denies having a gun that night. "I had felt the shots were for me," said Combs, who was with fellow rapper The Notorious B.I.G. minutes before his murder in 1997. "As fast as I could get down there, I was just trying to get away from danger." "Did you offer Fenderson $50,000?" asked Brafman. Under cross-examination, prosecutor Matthew Bogdanos intimated that Combs' testimony was a well-rehearsed performance. Combs acknowledged spending about five-and-a-half hours with his attorney in the last two days. On Wednesday, a security guard testified on the stand that he saw Combs' hands when shooting started in the nightclub and they were empty. The witness, Israel Ramirez of the Bronx, said he was drawn to the scene of the shooting inside the club when he noticed Trenton Stewart, a friend and security guard who was on duty, rushing across the floor. "I saw him trying to mediae an argument between two groups of people," Ramirez said. He said Combs was "mouthing off" near a circular bar in the Times Square-area club with his back to the wall. "I saw a wad of money being thrown over Mr. Stewart's head," the witness said. "After the money was thrown, that's when I heard the shots. After I heard the shots, I buckled. After a couple more gunshots, we were all lying on the floor." The witness further testified that Combs was on the floor, shielded by his bodyguard with his hands over his face until his bodyguard picked him up. Patricia Richardson of New Jersey also testified Wednesday that one of her best friends, wounded in the club shooting, told her she had no idea who had shot her. Richardson, who works in a Brooklyn beauty shop, said Natania Reuben, shot in the face during the fracas, made the statement while in a hospital's intensive care unit later that morning. But Richardson's testimony was directly contradicted by that of Dr. John A. Perrotti, who said he was on duty in the St. Clare's Hospital emergency room on Dec. 27, 1999, when Reuben was brought in between 3 a.m. and 4 a.m. He said Reuben blurted out that Combs shot her. Days earlier, Reuben had testified that she saw Combs and his rap protégé Barrow fire guns during a dispute. Reuben also testified that she did not know who shot her. Reuben's claim that Combs fired a gun has been contradicted by several defense witnesses who have said his hands were empty.